Can you imagine coming home to a collapsed roof? Talk about a day ruiner. What would be even worse is if you were home during the collapse. No matter what the size of a building is, whether it’s a larger structure or a smaller home, roof collapses are possible. However, can snow cause a roof collapse on its own? Or are there other factors that can contribute to a collapse? Today, we talk about the signs to look for in your roof to determine if it is at risk of collapsing, as we look at what exactly causes them, and finally, how to make sure you don’t become a victim of a roof collapse. Sprinkler heads are protruding from the ceiling — this is a telltale sign that something may be wrong with your roof. Because sprinkler heads are usually attached to the roof in a lot of commercial buildings, if they are looking a little off, then it’s likely a result of too much pressure on the roof. Look for water damage through the ceiling or cracks in the drywall. However, this sign will be most common in situations with warm weather. If you are worried about a potential roof collapse, check your attic for cracks in your roof. If you hear any cracking sounds while in your home, then get out if immediately and call a professional roofer to assess the potential for a collapse. Poor design – Just like a sloppily designed gingerbread house, an improperly constructed roof is at high risk of collapsing. Poor construction – Even a good design can’t make up for construction that cuts corners. No maintenance – Always be on the lookout for structural damage to your roof and fix it immediately. Older homes – Construction codes are always being updated, and old homes may have roofs that were designed with seriously outdated requirements. So, what about snow? Can it directly lead to a roof collapse? 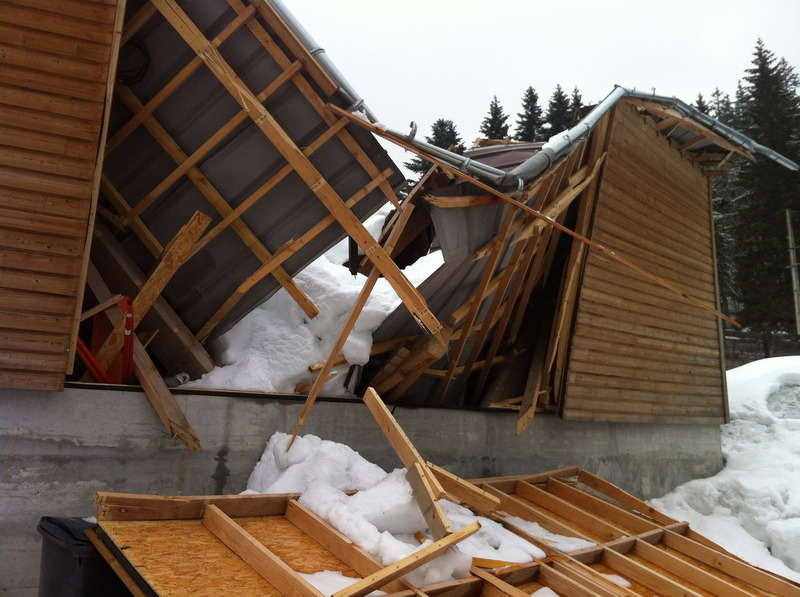 In most instances, snow is involved when it comes to a roof collapse — but often one of the previous factors we just listed accompanies it. For a roof to collapse because of snow on a home that is newer and was designed and constructed properly is extremely rare. However, combine heavy snow with any of them, and you may be in trouble. Fresh snow: 10-12 inches of new snow equates to 5 lb per square foot of roof space. So, about 4 feet of fresh snow would have to be on your roof for it to become stressed. Packed snow: Packed snow is a little different. Only 3-5 inches of old snow is needed to reach that 5 lb of per square foot of roof space, so over 2 feet of packed snow may be too much stress for your roof. Ice: 1 inch of ice equals 1 foot of fresh snow. The best way to keep your home safe during the winter is to remove snow from your roof during the winter regularly. A snow rake is your best bet, but if you have a serious amount of ice on your roof (or an ice dam), then calling a professional to come in and get rid of the ice is the smartest option. Don’t try and remove snow on your own by attempting to chisel it off; this will only damage your roof. Professional ice dam removers use steam to safely remove the ice, which will keep your roof looking great while eliminating the source of the danger. Whether at your home or your business, fire, flooding or a mold outbreak can be one of the most disruptive events imaginable. We’ll help you get everything back to normal ASAP, so you can resume living in your home worry-free. That’s the promise of the disaster restoration team at ServiceMaster. To reach our Emergency Service team, call (612) 354-5466.